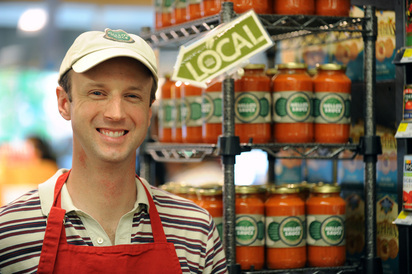 Neal "Nello" McTighe '00, owner of Nello's Italian Tomato Sauces. Photo Courtesy of the Orange County Vistors Bureau and Donn Young Photography. Support the program! Make a designated donation to the Italian Department. Our students have gone on to work in diverse fields such as law, education, finance, international business, marketing and advertising. Some have even used their knowledge of Italian language and culture to open their own businesses, while others have returned to Italy by receiving a prestigious Fulbright Grant. Davis Brown. My Italian Studies experience at Dickinson was the best academic decision I made in my four years. My experience studying in Bologna was unforgettable. The people I met, the places I saw, and the wide variety of lessons I learned was something I will carry with me forever. Entering my second semester of my junior year, the classes the department offered were diverse and intriguing. Not only did these classes help me expand my knowledge of the language itself, but also gave me a deeper understanding of Italy's rich history and culture. During my senior year, I took a class on Dante’s Divine Comedy. Come July, I was interviewed in Boston for a highly sought-after sales position. During the interview, the person who would eventually become my boss mentioned how he studied Dante in College. We went on, totally off topic talking for what seemed to be a long time about Dante and his poetry. I would like to think that this connection not only impressed him, but also demonstrated how well rounded I was as a candidate, giving me an advantage over other applicants. I credit this all to the Italian Program at Dickinson and the great professors who helped me along the way. Sarah DiMuccio. My experience at Dickinson would not have been as enriching or as fun had I not decided to minor in Italian. Coming in as a freshman, I actually didn’t need to fulfill the language requirement as I was already bilingual. I decided, however, that learning Italian would be incredibly cool – and I was absolutely right. From the first day of Italian 101, I fell in love with the Italian language and all that the Italian department had to offer. Not only did I learn to speak Italian, I learned about Italian food, literature, film, and culture. Studying abroad in Bologna for a semester and taking a university-level class the University of Bologna not only improved my skills in Italian, but it allowed to me recognize all that I was capable of. If you can survive a university class in Italian on Dante’s Divine Comedy, you can do anything you put your mind to! I am currently in a social psychology PhD program at New York University, and although I do not use Italian every day, I am convinced that being able to say I was trilingual set me apart from other applicants. In addition, learning about Italian culture both at home and abroad helped me develop my current program of research. I will always be grateful for the skills, both language-related and otherwise, that the Italian Department has given me. Aleksa D’Orsi. My experience as an Italian Studies major has certainly given me an advantage in my post-graduate endeavors. I double majored in Art History and Italian Studies and I was able to study abroad in Florence, Italy. The abroad program provided classes that fulfilled both my Art History major and my Italian Studies major. Spending that time in Italy and being able to speak the Italian language allowed me to immerse myself in the art of the country. Being able to speak the language made my abroad experience that much more fulfilling and has greatly elevated my analytical skills. I also believe that having been a double major at Dickinson College made me stand out as I applied to Graduate programs. I am now a member of the Class of 2017-2018 at the Christie’s Education program at Christie’s Auction House in New York City where I will be studying art law and business. In my essay, I referenced my double major and I discussed seeing renowned Renaissance artwork in Florence, amazing Modern works at the Palazzo Strozzi, and incredible contemporary pieces at the Venice Biennial. I look forward to using my Italian language knowledge again when I re-visit the Venice Biennial, but this time with a Christie’s Education. Vivian Sicilia. I currently work as an Education & Events Coordinator at Eataly Chicago, where I utilize my Italian on a daily basis. While I plan private and corporate events, I also oversee all the cooking classes that take place in La Scuola, Eataly's cooking school. We host classes on regional Italian cuisine and wine as well as seasonal ingredients. While at Dickinson, I took full advantage of the incredible Italian Studies program and also lived in the Romance Language House during my sophomore year, where I was able to converse with other Italians. At Eataly, I use my Italian everyday, whether I'm devising a menu, communicating with Italian colleagues, corresponding with Italian guest chefs, or leading Italian visitors around the store. It's been an incredible opportunity and has helped me keep up my Italian. I'm incredibly thankful for the relationships I built with professors from the Italian Studies department during my undergraduate experience. In the future, I hope to build a career in the Italian food industry. I am currently exploring various food studies graduate programs in Italy. Whatever I choose, I know I will use Italian in my future endeavors! Julia Gabrielle Barnes. As an aspiring translator from a young age, learning Italian proved to be the key to launching my career. Aside from Italian being a beautiful language, it is also very practical. The Italian publishing market is small and heavily reliant upon making connections. With the languages of major past colonial powers, like French or Spanish, many native speakers are necessarily brought up in a bilingual environment, which means more competition in the translation market. Italian, then, was a strategic choice; at its core, however, it is a passion. In the summer after graduating from Dickinson in 2014 I moved to an apartment in Milan with six Italian students who have become my best friends. I teamed up with Italian translator Giuseppe Sofo and began working for the publishing house Leone Editore, for which we have just translated our second book. This past summer, one year later, I translated an interview with Vladimir Putin for Il Corriere della Sera that was published in the New York Times. Currently I am working on literary translations for MJM Editore, Barbera Editore, and Italian author Davide Amante. During the day, I work as an English teacher in two Italian high schools in Milan, Italy, through the SITE program that my brilliant Dickinson professors encouraged me to apply for. In these schools I design my own curriculum and teach my classes independently, and am currently working on an article for Il Corriere della Sera about a series of classes I taught last year on feminism. Though all my coursework is in English, knowing Italian has allowed me to form lasting relationships with people in the school with whom I otherwise would not be able to communicate. My dearest friend of all at school is a 91 year-old nurse named Gina, a concentration camp survivor from Udine (in northeastern Italy) who speaks only Italian and German. I sit in her office every day to talk about her life, and she's become something of a moral mentor to me. I am so grateful that my schooling at Dickinson gave me both the linguistic capacity and cultural sensitivity to put down roots in this brilliant country and meet Gina and people like her. Becoming an Italian Studies major was really the best thing I've ever done. I now count as friends my former professors to whom I owe whatever success I have achieved. Margot Cardamone. Moving to Carlisle PA from San Francisco was a daunting transition, a transition that was made more difficult by the fact that I was leaving my large Italian family behind. I was born in Varese, Italy and moved to California when I was young. At home we only spoke Italian (and only ate Italian food) and my first semester at Dickinson I missed being surrounded by Italian energy. I decided to take an Italian course with Professor Pagano and quickly found a home within the Italian department; a home filled with the Italian language, culture, and food I was so dearly missing. The interdisciplinary nature of the Italian department allowed me to study aspects of Italian history I knew nothing about: Italy's attempt at colonial rule in Libya, Ethiopia, and Eritrea. I continued these studies in Bologna where I spent the academic year. While in Bologna, I worked at an International law firm and taught English. After graduating from Dickinson as an Italian and History double major, I moved to Charlotte NC to teach fourth grade through Teach For America. The English teaching experience I had abroad served as an asset for the Teach For America application process; however, I think my ability to problem solve and generate creative solutions set me apart from the other applicants; all skills I learned though Dickinson and the Italian department. I was elected as the Young Alumni Trustee for the class of 2014 and served the college for 2 years in that capacity. In 2016, I moved to Boston to pursue my Master's in Education at Harvard University and graduated in the spring of 2017. I now work at Tufts University in the Office for Student Success and Advising as a Student Success Advisor. I am eternally grateful to the Italian department for the skills they taught me and the relationships I forged through the program. I hope I can support my students at Tufts helping them find their home away from home the way Dickinson's Italian department did for me. Brian Gerney. Having arrived at Dickinson as a freshman with no desire to take any language courses at all, I was probably the most surprised that I ended up majoring in Italian Studies. This choice became one of the best decisions I made during my four years as an undergrad and a fundamental part of my college experience that I would never trade for anything. The support and guidance I received from all the Italian professors as I navigated the lower level courses gave me the confidence not only to continue with the major but also to pursue other academic interests outside my comfort zone. As a Political Science/Italian Studies double major, the flexibility and support of the Italian department was invaluable and the study abroad experience in the Bologna program perfectly matched my goals and interests. While in Bologna, I had the chance to play for a club basketball team (Giardini Margherita) that not only introduced me to the local culture, but also put my language skills to the test as I tried communicate with my teammates and sometimes even argue with referees who spoke no English. I am still in contact with my teammates today. After graduation, I obtained my masters in Economic Geography at UNC Charlotte and found my experience with Italian urban design to be very helpful as many of the strategies employed by cities and planners in the United States are commonplace for most Italian cities. Likewise, in my professional career, dealing with fashion oriented real estate, not only is it always a great conversation starter to have studied Italian and spend a year in Italy but almost all new projects are attempting to capture the magic of an Italian piazza or the pedestrian oriented streets that help make a place like Bologna so special. Luca May. I was naturally attracted to Italian Studies at Dickinson as I grew up speaking Italian at home with my mother, a native Italian who immigrated from a small town outside of Milano named Vaprio D'Adda. The first language courses I took with Professor McMenamin helped me perfect my grammar and really sparked my passion for the Italian language and culture. Professor McMenamin quickly urged me to go for a major over a minor in Italian, and this would prove to be a paramount decision for my academic and professional career. This decision to major in Italian Studies allowed me the opportunity to become the first Dickinson student to study abroad at the University of Perugia for Foreigners, in Perugia, the home town of Professoressa Marini-Maio. There was a very special learning environment at the University because my classes were made up of foreigners from all over the world who were there to learn Italian. I earned a certificate of the C1 level and had the opportunity to study at C2, the highest level, for my last 3 months. After studying abroad I became an Italian citizen and before graduating I had a job lined up in Florence, Italy at Bus2alps AG, the market leader in European student travel. Since Bus2alps operates most of its tours from Italy, I was an attractive candidate for the organization. I started as a Sales and Logistics Specialist and eventually became the Sales Supervisor of the company where I managed and motivated a team of 35 direct full time Sales Representatives. Italian Studies at Dickinson undoubtedly prepared me for a successful 2.5 year career in Florence, Italy. I have recently moved on from Bus2alps and am continuing a career in sales as an Account Executive for TransPerfect, the world's largest privately held provider of translation/localization services, in Chicago. Melia Bonomo. Studying Italian at Dickinson provided me with many amazing opportunities to learn about and experience the beauty and rich history of the Italian culture. I absolutely loved the Dickinson in Bologna study abroad program, during which I was able to take a medical physics course at the University of Bologna. Not only did it enrich my major in physics and minor in Italian at the same time, but also through this course I got to collaborate with my professor to write a Fulbright research grant proposal. After graduating from Dickinson, I was an intern for the SITE Program in the Lombardy region of Italy and was placed in the charming little town of Crema, outside Milan. I worked there for two years teaching English to high school students, both in regular language classes and through CLIL (Content and Language Integrated Learning) modules in physics, chemistry, biology, math, art, and history classes. I’m currently in the Applied Physics PhD program at Rice University, but I still feel a strong connection to Italy and hope to return to teach or do research there after finishing graduate school. Mariya Hristova. I currently work as an Account Manager for the Global Language Service Provider, TransPerfect in Milan, Italy. I became part of the Italian Department at Dickinson after having completed the year-long study abroad program in Bologna. The possibility of getting to know the professors while improving my language skills and understanding of Italian culture was an absolute pleasure for me. The valuable knowledge and great experiences I had with the Italian Department have undoubtedly contributed to my success in getting a full time job and eventually moving to Italy just a couple of weeks after graduation day. If you are passionate about languages and are looking for a truly meaningful experience while at Dickinson I would not give it a second thought but run to ask for information – the Italians will do the rest. Justin Ruffini. I am currently a first year student at Brooklyn Law School. The knowledge and skills I acquired as an Italian Studies major, along with the opportunities and experiences the department made available to me outside of the classroom, have been invaluable. At Dickinson, whether I was translating and interpreting the poetry of Petrarch, analyzing the role of landscape in Italian society, or examining representations of terrorism in Italian cinema, I learned to question, to think critically and creatively, and to write and develop strong communication skills, all of which are necessities in law school. In addition, as an Italian studies major, I had the opportunity on many levels to collaborate, relate, and listen to individuals from diverse backgrounds, which has been an asset not only in law school but my everyday life as well. I learned Italian, lived in the Romance Language house with international students, and studied for a year at the Dickinson Center in Bologna where I gained a global perspective and a glimpse of the world not just from the eyes of an American but from the eyes of the individuals I met and studied with who came from all over the world. After graduation, I returned to Italy to participate in The Network of Autonomous Schools of the Lombardy Region’s Study and Intercultural Training and Experience (SITE) program, another opportunity made possible by Dickinson’s Italian studies department. I worked as a teaching assistant at The Istituo Tecnico Professionale “Tassara-Ghislandi” in Breno, Italy and also provided English tutoring for the children of various families in the town. The internship offered me valuable teaching experience and the chance to navigate the working world in another culture. Just as importantly, it also allowed me to truly become part of an Italian community. I hope to return to Italy next summer to participate in Brooklyn Law’s Summer Study Abroad Program held at the Faculty of Law of the University of Bologna. Michael Dalton. I went on an internship to Italy following graduation to teach English to Italian High School students as a part of the Scuole di Lombardia program (SITE program). I worked in Italian with faculty in school and created my own lessons, teaching them to the Italian students in English. I used Italian every day and all-day in the small town I lived in (Crema, provincia di Cremona) and stayed with a host family. My Italian experience at Dickinson was phenomenal and I'm continuing to use my Italian now, taking classes twice a week with a tutor. I am currently a legal assistant at my father's law firm in Delaware. However, I'm also currently working to get into the importation business - facilitating small artisan Italian producers to sell their products in the US. Without Italian and my experience at Dickinson and following Dickinson with my internship (which was through Dickinson's Italian department), I would never have had any of the opportunities available to myself. Joey Kirk. My Italian Studies major at Dickinson has been extremely helpful in my career by teaching me how to better understand diverse cultures and communicate beyond language. Following graduation, I was as an admissions counselor at a small, private, Catholic college outside of Philadelphia before completing a Masters of Arts in International Education in December 2012. Currently, I work for the British Council out of the British Embassy in Washington, DC where I promote international experiences to American students. I continue to use the Italian language visiting Italy, staying in touch with Italian friends and participating in events and meetings at the Italian Embassy. Samuel Meller. Italian is an extremely useful language because of its versatility. Currently, I am in my second year of law school (University of Georgia School of Law) and I will be next year's senior articles editor for a Journal of International & Comparative Law. As a law student, having Italian is especially helpful to understand the literal translation of some legal Latin phrases. As a member of the editorial board of an academic journal on international law, I have used my background in Italian to help translate legal texts for my colleagues on the editorial board and to get a better understanding of European legal issues, which occurs often in discussions of general international law. Christina Brumbach. I minored in Italian. Since graduation in May 2008, I have been living in Italy. I first worked as an English teaching assistant on a Fulbright grant at two public high schools in Rome and have since lived in Bologna teaching English in different venues to children and adults. Italian has been vital to my daily life and will hopefully help me learn Spanish when I move to the US to teach. I am currently teaching children English in Bologna, but will soon transfer to Boston where I will go to graduate school for elementary education and ESL. Deborah Hicks. Not merely my major in Italian Studies, but moreover, the guidance from the professors in the Italian department at Dickinson have shaped my career since my graduation. Were it not for their enthusiasm and encouragement, I would not have fallen in love with Italian culture because I never would have understood it on such a profound level. They opened the doors for my exploration of a different world, and also helped my find a career in teaching. I am currently teaching English as a second language outside of Milan, and hope to continue teaching in some context in the future. Lucy Vandervort. I have always thought of Italian as the most beautiful language, and at Dickinson I was able to fully indulge my love of it. The crowning moment of my Italian-language experience at Dickinson was the year I spent studying abroad in Bologna—I fell completely in love with the people, food, art, way of life, etc. It was the best experience of my life, and I will never forget it. I am also able to say that my Italian language skills have benefited me post-college, as I have been providing Italian-English translations for a historian who is writing a book about the Italian war in Libya in the early 1900s. I would encourage anyone with a love of or interest in the Italian language to explore it at Dickinson. For me it was an experience I will always cherish—and I am fluent in Italian! Tiffany Bistocchi. After graduating from Dickinson I lived in Perugia for one year and studied at the Università per Stranieri di Perugia. I then went on to study at the Università degli Studi di Firenze with Middlebury College. I earned my MA in Italian Studies from Middlebury College in 2006. I taught elementary school Italian and I currently teach high school Italian. I have also been teaching adult Italian classes for the past five years at night. Ellen Laird. After graduating from Dickinson, I had a strong desire to return to Italy and use my knowledge of the language and culture in a working environment. I returned to Bologna and began teaching English as a second language at a local, private language school. Even though I was teaching the English language, my knowledge of Italian was very useful because it helped me have a better understanding of how my students were progressing in their efforts to learn the English language. I understood why they made certain mistakes or why they confused certain words or grammar rules based on their own native language. My knowledge of Italian helped me to better address my students’ needs as a teacher. My knowledge of the Italian language and culture was also very useful and important in my everyday life in Bologna. It helped to have a good understanding of how things “worked” in Italy, both bureaucratically and socially, when it came to finding an apartment to rent, searching for work, meeting new friends and networking with people. My knowledge of the Italian language and culture continued to grow during my time Bologna after graduation, and this knowledge has been fundamental in my position as the Bologna Program Associate for Dickinson’s study abroad program in Bologna, Italy. I have been working for the Bologna Program for four years, and I thoroughly enjoy being a part of Dickinson College’s overseas network. My education in the Italian language at Dickinson College, and my experiences abroad in Italy, both as a student and after graduation, were key elements to helping be where I am today. Lisa Sabetta. I use my Italian every day on both a professional and personal level. After majoring in Italian Studies at Dickinson I decided to use my Italian skills as a way to enter the work force in a way that would set me apart from others applicants. Following graduation, after two years as a paralegal at an UK law firm in Milan where I translated legal documents, I decided to come back to the States in order to pursue my passion for the fashion and luxury sector. Even at that time during those months when I was unemployed and between jobs I was able to find a temp position as a receptionist at an Italian bank in NY - while continuing to look for jobs that would allow me to utilize my Italian and follow my dream. I currently work in marketing for an Italian men's fashion company - where I use my Italian every day, whether it be in communication with my Italian boss in the office or over the phone or in emails to headquarters in Milan. Continuing to use my Italian has also allowed me the opportunity to keep in touch with many friends made over the years and popular Italian culture (music, movies, sports, gossip, fashion and even youth slang which I manage to sprinkle into my spoken Italian!). The journey that I have taken with Italian was set in motion first semester freshman year at Dickinson in my first Italian class and has continued to this very day - and for that i am extremely grateful. Neal McTighe. Studying Italian at Dickinson College has turned out to be one of the single-most important and influential decisions of my life, and it certainly was the belief in my abilities by the Italian faculty at Dickinson that led me to believe I could succeed beyond the limestone walls. After I graduated from Dickinson, I earned an MA in Italian from Middlebury College and then a PhD in Italian from the University of North Carolina, Chapel Hill. Along with teaching Italian at a small college in Raleigh, I am the founder and managing partner of one of the leading premium tomato sauce companies in the southeast, Nello's Sauce. Brendan Jay Williams. Although Italian is a beautiful language, my love of the language has always been something I experience in a very practical way - I was never much interested in literature or poetry; for me, Italian was a key that could unlock the door to Italian culture and to Italy itself. So although I appreciate Dante, what really excited me was being able to use Italian in daily life, to see a movie, to travel, to converse with Italians in Italian in Italy. My year studying with Dickinson in Bologna was one of the most formative and memorable of my life. I studied Italian for love of the language; I never expected that it would help me in my career. However, I landed my first real job out of Dickinson (as a mutual fund analyst for Bloomberg) precisely because of my fluency in Italian. Although I knew little about finance at the time, their reasoning (I always assumed) was that it would be easier to teach finance to a fluent Italian speaker than to teach Italian to a finance major, and so I got the job. I was a dual Italian Studies / International Studies major, and after a couple of years I decided to go back to school to get a Master’s in International Relations. As fate would have it, I ended up back in Bologna for a second year, this time studying on the Johns Hopkins program, where I met a beautiful young Italian student whom I would end up marrying (seven years ago today). We have three young (bilingual) children, and live near Oxford, England. Last year, I passed the psychologically significant milestone of becoming an Italian citizen, a step I can trace directly back to my Italian 101 class at Dickinson. Needless to say, the Italian language and culture are still very much a part of my life every day. Angela Hertz. In May of 2014, I and my husband Marco Marzulli, PhD and colleague Derek Illar, JD, started the non-profit organization called La Scuola d'Italia Galileo Galilei, an Italian language school and cultural association, that offers after school programs for k-12, as well as adult and family courses, summer camps, Italian film nights, group conversations and lots of other free events for adults and children in the Pittsburgh area. I graduated from Dickinson College with a major in English, and two minors: Italian (only one course shy of the major) and Art History. I subsequently returned to Pittsburgh, continued with my Italian language studies at the University of Pittsburgh, and went to study abroad in Florence, Italy both in 2000 and in 2001-2002. After that time, I returned to Pittsburgh to finish a master's degree in Italian literature in combination with a teaching certificate through the education department, and soon moved on to a career of 14 years of teaching Italian in several different locations to all ages from children to adults. This April 2017, the organization that I co-started has now opened a daycare/preschool, the first of its kind that includes full immersion of the Italian language and possibly other languages as well. Laura D’Ambrosio. At Dickinson, I was an Italian Studies major and participated in the Bologna program my junior year. My experience in Bologna deeply influenced my life after Dickinson and Italian continues to be a large part of my life today. After graduation from Dickinson, I returned to Rome, Italy to study for my MBA in international finance at St. John's University Rome campus. The additional two years in Italy helped me not only to obtain an MBA, but also to perfect my Italian language skills. While in Rome, I participated in an internship at Fendi in their financial department and upon graduation from my MBA program, I returned to the US and received a job offer from Prada in NYC. At Prada, I was a retail analyst and traveled often to and from Milan for the fashion shows. In 2002, I accepted a job at the university where I had completed my MBA and returned to Rome to work at their campus in Italy. I was responsible for all of the marketing, recruitment, admissions and special events for the Rome campus of St. John's University. In 2004, I met my husband who is Italian and we were married in 2007. We remained in Italy until 2010 and are currently living in Doha, Qatar. I believe that the positive experience that I had in Bologna really expanded my mind and my interest in living abroad and learning about different cultures. In addition, studying Italian and becoming fluent in another language gave me an advantage over other applicants in several of the jobs that I have held throughout my career. I am appreciative that Dickinson puts such a strong emphasis on studying a language and on having an experience in living abroad as it truly has influenced the direction that my life has taken! Susan Ingall (Fish). My Italian Studies major directly lead to my first job in International Advertising. Quite frankly they needed someone who spoke Italian. I used it throughout my career in Europe as a media planner and negotiator. I used both my French and Italian. My Italian was essential to my work as I was based in UK and booked advertising for my clients in Europe. Obviously France and Italy were my main responsibilities. One of my biggest accounts was to help launch Nike across Europe. Of many jobs, one was to help them understand the Italian media market. I no longer work in advertising, and have taken up a latent passion and now work on a part time basis as a veterinary assistant. But I still use my Italian from time to time. It could be anything from a trip in Italy to an event of my husband's where someone might be more comfortable speaking in Italian. It probably was the most useful major I could have taken. Katherine Volkmer. While I am not of Italian heritage, I found and continue to find Italian Studies a compelling field of study. Italy has a profound political history from the rise and fall of the Roman empire to the complexity of its political parties since its unification. Italians have made a vast contribution to the literary world (Dante, Goldoni), science and education (da Vinci, Marconi, Montessori), fine arts (Michelangelo, Caravaggio, da Vinci, Botticelli) and music (Monteverdi, Verdi, Puccini, Rossini, not to mention performers such as Mirella Freni and Luciano Pavarotti) as well as cuisine and wine, fashion and even automobiles. Culturally speaking, it is also unbelievably diverse. There are plays and poetry and idiomatic expressions written in multiple dialects. It is also notably the closest modern day version of Latin and has expanded my vocabulary tremendously in English. I was first exposed to Italian as a young child through listening to opera and then study of piano and voice. (All musical notation continues to be written in Italian – even if the composer is Chinese or Czech. It is a global language of music. Even in my toddler’s music class, they were taught “piano e forte” and not “soft and loud”.) I then became interested in Italian art as I studied studio art and attempted copying some of da Vinci’s and Michelangelo’s sketches as a form of study. I traveled to Italy with my art class in high school and was immediately taken with the country and beauty of the spoken language. I was determined to study Italian in college. (It was not offered in my high school.) I began an independent study program in Italian Studies with the guidance of Tullio Pagano as the Italian Studies major was not yet established when I began this trajectory. Since graduation, I have always found ways to incorporate Italian into my career. I taught English to Italians in Italy and did free-lance translation work. I worked for a satellite office of The Johns Hopkins University in Italy. I ultimately worked in finance in International Correspondent banking and managed the Italian accounts (Italian banks were my clients). (I worked periodically in the Milan office as well.) Finally, I changed careers after our son was born and have pursued a dream. I established my own business teaching Italian to young children. I have developed (and continue to expand) a curriculum - including songs and props and crafts which I create in Italian – which is relevant to young children. I am teaching through the use of music, rhymes, and props and handouts covering topics relevant to small children – everything from zoo animals to brushing teeth and naming the planets. Italian is a language of great import and can be used in numerous career paths. Matthew Rodano. I was the person who actually lobbied to have Italian Studies made as a Major from a Minor and was one of the first persons to do a double major in Italian Studies and International Studies. Being an Italian Studies Major has helped me a great deal in my career and I try to use it as much as possible. Through my use of Italian, I have increased my knowledge and understanding of other foreign languages such as French, Spanish, Portuguese, and more. Currently I am Vice President of Client Relations for The LanguageWorks, Inc. It's a foreign language translation agency. I have been in the industry for 16 years now. I actually used to translate and teach entry-level Italian to children and adults. The background and information that I learned have been extremely helpful. It helped me too in my Study Abroad program in Bologna, Italy. I even worked as a translator for a short period of time from Italian into English. If you would ever like for me to address students on the subject, I would be more than happy to do something via Skype or come to Dickinson for a visit. Regina Psaki. When I was at Dickinson, there wasn't a major in Italian Studies yet. But my study of Italian in Bologna and at Dickinson was essential for my career because it led to my current job as an Italian language and literature professor at the University of Oregon.